Below is a guide to setting up and customizing the Event Types section of your Táve account. You can find them in Settings › Event Types under the List section. 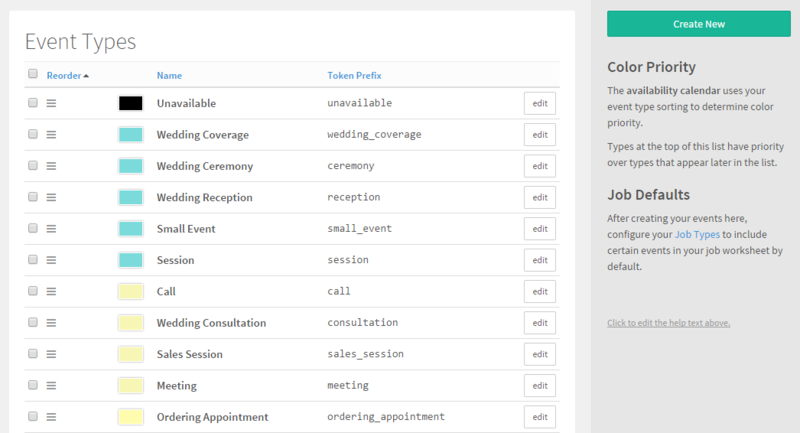 Each of your bookings in Táve are called jobs, while all of the sessions, meetings, and other interactions you have with your clients on a job are called events. 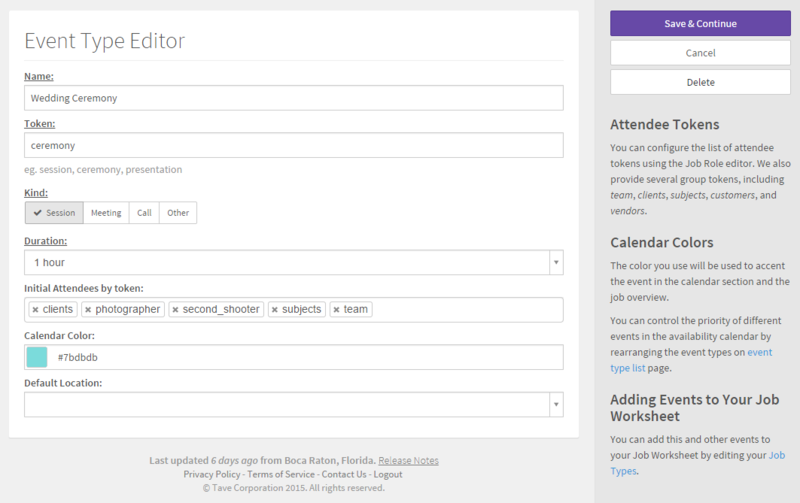 In your Event Types settings, you can customize the types of events you typically schedule on the various jobs you book. If you’re a wedding photographer, some crucial event types may include a consultation, ceremony, reception, and ordering appointment. Portrait photographers can keep things broad by using one event type for sessions, or specify separate event types for engagement, newborn or headshot sessions, for example. When creating or adjusting an event type, you’ll see various options. You will start out by choosing whether the event is a session, meeting, phone call or other type of event. Next you can select the default duration of the event, although keep in mind this can be adjusted if needed when scheduled on an actual job. A really important part of the event type setup is choosing who the initial attendees are. Do you want to ensure that your events appear on your Táve user calendar feeds when they are assigned to the job? Set up your event types so that all team job roles on the job’s contact list will be event attendees by adding “team” to the initial attendees by token field. You can add other types of contacts to this field for those who by default attend the event type you are editing. You can then choose the custom color you’d like this event type to be when viewing your bookings on your Táve calendars in the calendar color option. The last customization for an event type is the optional default location setting. This is most commonly used if you almost always hold a sales meeting, for example, at your studio. Here, you can select one of your saved address book locations from the dropdown to set the default location when this type of event is scheduled on a job. After you have set up your event types here, be sure to head to Settings › Job Types to customize your various job types to include the appropriate default events on their job worksheet to save you some time as you receive new leads. Learn more about customizing your job types here.